Video footage of the seabed was taken around HIMI during the 2003/04 summer. This provided the first pictures of a diverse array of animals including commercial fish species (Patagonian toothfish and mackerel icefish), octopus, spectacular gardens of feather stars, sea anemones and soft corals. Due to the extreme isolation of Heard Island and McDonald Islands (HIMI), together with the persistently severe weather and sea conditions, human activities in the region have been, and remain, limited. Since the first landing on Heard Island in 1855, there have been only approximately 240 shore-based visits to the island, and only two landings on McDonald Island (in 1971 and 1980). 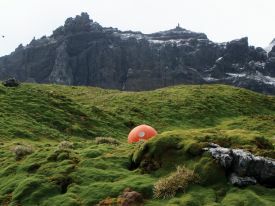 Visits to Heard Island were initially associated with wildlife resource exploitation (see the 19th century sealing pages in the History section of this website) and then for research and management, private expeditions and for surveillance purposes. Activities in the waters surrounding the islands include fishing in the Australian commercial fishery adjacent to the HIMI Marine Reserve, and infrequent shipping. Terrestrial and marine research, undertaken as part of the Australian Antarctic science program, is currently the main human use of the Marine Reserve, while commercial fishing in the adjacent HIMI fishery is the most frequent activity in the region. Further information on human activities at HIMI is given below. These human activities have the potential to impact on the conservation values of the Reserve, as outlined on the Pressures pages of the Protection and Management section. Although hindered by the extreme isolation and unfavourable working conditions, scientific studies have been carried out on Heard Island since the first research visit by scientists from the HMS Challenger in 1874. See the Research Expeditions pages in the History section of this website for more information. Since the operation of the Australian National Antarctic Research Expedition (ANARE) station at Atlas Cove from 1947 to 1955, the Australian Antarctic Division (AAD) has mounted over 30 Australian Antarctic program expeditions to the HIMI region, to conduct science and to undertake environmental management activities, such as the removal of waste material from the Atlas Cove area. Research has involved a broad range of terrestrial and marine science disciplines, including geology, geomorphology, vulcanology, meteorology, terrestrial and marine ecology, glaciology, oceanography and cultural heritage study. See the Research section of this website for more information. Recent scientific programs have focused on understanding the effects of climate change on the biodiversity and function of terrestrial and lake ecosystems; studying the glacial systems of Heard Island as an indicator of climate change and variability; monitoring long-term trends in seabird populations; and examining the interactions between key land-based marine predators and their interactions with prey, the ocean and benthic environment and commercial fisheries. Australian Antarctic program expeditions are generally multi-disciplinary, with shore parties consisting mostly of scientists, with several logistical support crew, who may stay on the island for a few weeks or months. Personnel usually split into project-specific groups, accommodated in huts or tents at Spit Bay, Atlas Cove and other minor camps distributed across the island. Power is supplied by small diesel generators, solar cells and wind generators. Wastes are stored for return to Australia, incinerated (where combustible and non-toxic) or, in the case of human wastes and washing water, disposed of into the ocean. Extensive marine research has been conducted in the HIMI region since 1990. The AAD coordinates scientific research programs that address sustainable use of resources and ecosystem dynamics, and which contribute directly to management measures for the HIMI fishery. This research involves fish stock assessment surveys and studies of the foraging activity of land-based predators. The Australian Antarctic science program is seeking to increase its subantarctic research in the HIMI region, to reflect the increasing interest in and importance of the region from a scientific and marine resources perspective. Current intentions are for the AAD to support Australian Antarctic program summer visits to the region approximately every three years over the next decade to undertake research, monitoring, and any required on-site management activities. The wildlife, vegetation, cultural heritage, spectacular landscape and remoteness of HIMI are major attractions for private recreational and tourist visits. However, due to the large distance from major ports, the persistently rough seas and associated uncertainties, both in landing and in the conducting of activities on arrival, there have been few privately-organised visits to the islands since the cessation of sealing and whaling activities in the early 1900s. Landings and activities during each of these private visits have focused on Heard Island. A low number of private yachts and commercial tourist vessels have visited Heard Island, although few successful landings have been made due to poor weather. Other private expeditions have included brief visits by ham radio enthusiasts, private scientific groups and mountaineering parties. Successful ascents of Big Ben have been made on three occasions: by members of the Southern Indian Ocean Expedition in 1965, by members of the Anaconda expedition in 1983 and by members of the Australian Army Alpine Association in 1999/2000. The number of private visits per decade to the HIMI region shows little or no sign of increasing in the foreseeable future, but tourism to the Antarctic, particularly the Peninsula area, has been growing steadily since the early 1990s, with many voyages including visits to several subantarctic or Antarctic sites. Future increases in recreational and tourism activities, if any, could be expected to be concentrated ashore at Heard Island and in the near shore waters of the territorial sea. Surveillance patrols in the HIMI region are by civilian and Australian Defence Force vessels and are principally aimed at enforcing fisheries legislation, and detecting and deterring illegal foreign fishing activities within the HIMI Australian Fishing Zone (AFZ). These patrols also provide opportunities for the surveillance of other illegal activities in the Reserve. Details of the frequency and duration of surveillance patrols in the area are confidential. However, patrols cover the waters of the Reserve and make landings at Heard Island to check for evidence of illegal activities and to undertake limited, opportunistic management tasks. A treaty signed by Australia and France in 2003 also provides for cooperative surveillance activities in the adjacent exclusive economic zones (EEZs) surrounding HIMI and Îles Kerguelen. Under that treaty it is possible that French vessels may undertake surveillance patrols in the HIMI EEZ, including within the Reserve. The HIMI region is remote from any major population centres and conventional shipping routes but does receive visits from vessels involved in scientific research, fishing, fisheries surveillance and occasionally from tourist and other private vessels. The ports from which these vessels have departed in recent years include Hobart, Fremantle, Albany, Esperance, Port Louis (Mauritius), Durban (South Africa), several ports in New Zealand and a variety of locations in Antarctica. The seas in the HIMI region, which are normally rough, occasionally become sufficiently severe that vessels in the area seek a place of refuge in the lee of Heard Island. The Australian Antarctic Division (AAD) generally maintains one or two refuges on Heard Island which are equipped with basic provisions, but because their presence and ability to be maintained varies with AADs operational requirements these cannot be relied upon for shelter. Due to its remoteness and lack of permanent population, there is no indigenous or recreational fishing activity in the HIMI region. Australian commercial fishing within the HIMI exclusive economic zone (EEZ) began in April 1997, and targets mackerel icefish Champsocephalus gunnari and Patagonian toothfish Dissostichus eleginoides. Consistent with the HIMI Marine Reserve being assigned to the IUCN category strict nature reserve, commercial and recreational fishing in the Reserve is prohibited, however fishing vessels may cross the Reserve to reach fishing grounds. The HIMI fishery falls within the area of application of the Convention on the Conservation of Antarctic Marine Living Resources (CCAMLR) and, more specifically, within CCAMLR Statistical Division 58.5.2. The fishery is managed under the provisions of the Fisheries Management Act 1991 and the Heard Island and McDonald Islands Fishery Management Plan 2002 by the Australian Fisheries Management Authority (AFMA), in a manner that complies with or exceeds the standards required by the CAMLR Commission. Conservation measures for fishing in the region include precautionary catch limits for both target and bycatch species, that take account of predator-prey relationships; independent scientific observers on all voyages; collection and analysis of a wide range of catch data and samples; restrictions to minimise non-target species interactions, and ongoing research on the ecological sustainability of targeted and bycatch fish stocks. Holders of statutory fishing rights in the fishery contribute resources to, and assist in the conduct of, an annual fisheries research program to assess the status of fish stocks and other issues related to the presence of a commercial fishery, as stipulated in the management plan for the fishery. Some of this research is undertaken in areas within the Reserve under strict permit conditions. This research typically includes an annual survey designed to obtain reliable estimates of recruitment for each target species and other work to assist in monitoring of the potential impacts of the fishery on non-target species and the ecosystems of the HIMI region. More information about the HIMI fishery is available from the AFMA website. Illegal foreign fishing is considered not to target waters of the HIMI Marine Reserve, but does occur in some locations outside the Reserve that coincide with the Australian commercial HIMI fishery. Illegal fishing therefore primarily threatens the fish targeted by the licensed fishery. Australia is committed to combating illegal fishing in the EEZ around HIMI, and the region is the focus of growing national and international efforts to combat illegal fishing. A voluntary International Plan of Action for Illegal, Unreported and Unregulated (IUU) Fishing has been developed through the Food and Agriculture Organisation of the United Nations, within the framework of the Code of Conduct for Responsible Fisheries, and further measures may be adopted by the Commission for the Conservation of Antarctic Marine Living Resources. Australian compliance and response actions are primarily the responsibility of the Australian Fisheries Management Authority (AFMA) and the Department of Agriculture Fisheries and Forestry, in close consultation with the Australian Antarctic Division (AAD), Attorney Generals Department, Department of Foreign Affairs and Trade, Department of Defence and Australian Customs Service.